Transport trays, chafers, and other items for your banquets and catered events with this Lakeside 594 stainless steel Queen Mary banquet cart! 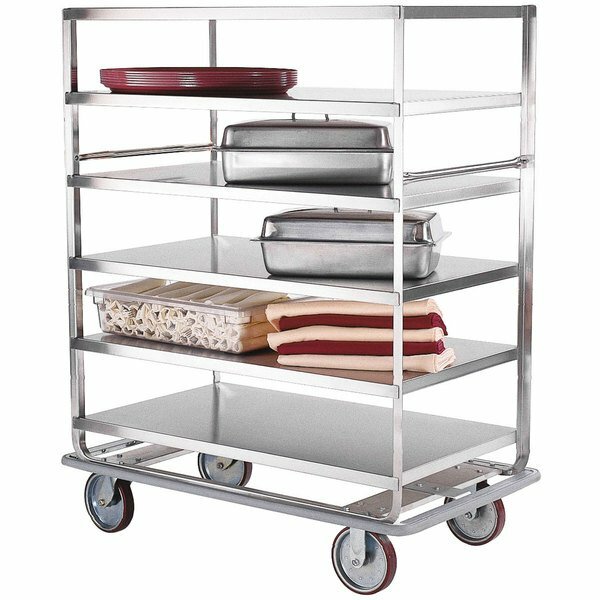 This banquet cart features (4) 28" x 70" flat shelves with an overall carrying capacity of 1000 lb. so you can save trips and transport heavier loads with one convenient cart. Built for long-lasting durability, this welded unit features 18 gauge stainless steel shelves and a 14 gauge leg / frame assembly. Strong and sturdy, the stainless steel construction is also easy to clean and sanitize. Each shelf edge drops down, allowing for easy loading and unloading from all sides of the cart. With the help of tubular push handles on both ends, this Lakeside Queen Mary banquet cart is easy to transport throughout your food service facility. No mark cushion tread wheels allow quieter and smoother operation, while 2 fixed and 2 swivel 8" casters guide the cart in a straight line and make it easier to turn! A vinyl perimeter bumper extended from the frame also helps protect walls and furniture during transport.